The rod dryer itself does not “dry” anything itself. 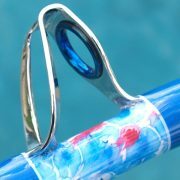 Instead – it is a device that holds and turns the rod while the finish dries. The reason you spin the rod during the curing process is to make sure the epoxy self-levels so you end up with a unified coat, free of bulges and uneven bumps. How long the rod needs to be in the rod dryer will really depend on the amount of finish you use, as well as the viscosity of the finish. For a simple example let’s look at the Pro Product finish called ProKote, which comes in Standard and High-Build versions. The Standard version has a lower viscosity, applies in a thinner coat, and takes longer to cure. The High-Build version has a higher viscosity, applies in a much thicker coat, and cures 25% faster its Standard counterpart. Based on the curing time alone, the Standard finish would need to be in the rod dryer longer than if you used the High-Build. 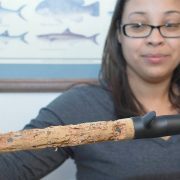 This would remain true no matter what speed rod dryer you use. The desired dryer speed needed for each application really depends on several factors – so let’s talk about a few of them. 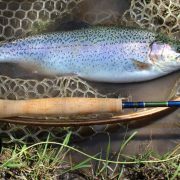 Traditional wisdom may suggest that slower rod dryers would be better suited for those new to rod building, but that is not necessarily the case. For example, let’s say we want to apply a nice straight epoxy edge to the ends of our wraps. Some people just naturally find it easier to make a straight edge when the rod is spinning faster – because you have to keep your hand steady for less time. Conversely, some people just naturally find it easier to control their brush stroke while the rod turns at a slower speed. So there is really no right or wrong here – other than getting a feel for what feels right for you. There is no right or wrong, pick the speed That is right for you! According to Mud Hole Custom Tackle, who sells more rod dryers each year than anyone in the business, we can share an interesting statistic. If we use the CRB Rod Drying System as an example, they sell far more 9 RPM dryers (slower speed) than they do 18 RPM dryers (higher speed). This does not mean one is better than the other – but it does suggest an overall preference among rod builders. 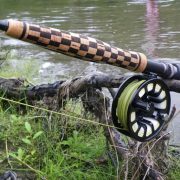 Something to keep in mind if you are new to rod building and are looking for a rod dryer but not sure what to buy. Guide types and thread selection are also considerations when selecting a rod dryer speed that will fit your needs. For example, if you are wrapping small guides, the area to cover with epoxy is small, so you can choose the speed you prefer. As mentioned above – faster or slower based on your own likes or dislikes. 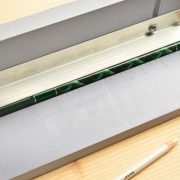 However, if you are wrapping big roller guides – sometimes with a double wrap – then not only do you have a larger surface area to cover, but you need to brush epoxy under the thread-foot area to seal that up. This is where speed plays a role. A slow rod dryer will allow you more time to stuff that epoxy under the thread and foot area to make sure it is sealed, as well as applying a thicker initial epoxy base so it has time to soak into the thread wrap areas. Variable speed rod dryers would be another option here, where you could slow it down to apply the base coat, then speed it up higher when applying the final finish and get those edges just right. Some rod dryers come with a clutch which allows you to grab the rod (stopping its rotation) while you apply the finish, then release the rod to continue spinning while you perform final touch ups. CRB also has a version of this. If you build rods as a business, or just build many rods as a hobbyist, the more rods that can be done in a set amount of time means higher productivity – and this is where speed matters. Experienced rod builders (and OEMs) often use very high speed rod dryers, often exceeding 100 RPM or 200 RPMs. That’s pretty fast, and generally requires investing in a more expensive device, or building a custom rod dryer from parts yourself. For many businesses and rod builders we talk to, however, they find that an 18 RPM rod dryer is plenty fast. Rod dryers are also used to make rod repairs and for adding decorative accents like decals & stickers, where once applied – a layer of finish is needed to protect them. Pulling again from Mud Hole’s data, we can say that a slower rod dryer speed (9 RPM) is exponentially more popular for repairs and adding decals than faster dryers (18 RPM or faster). 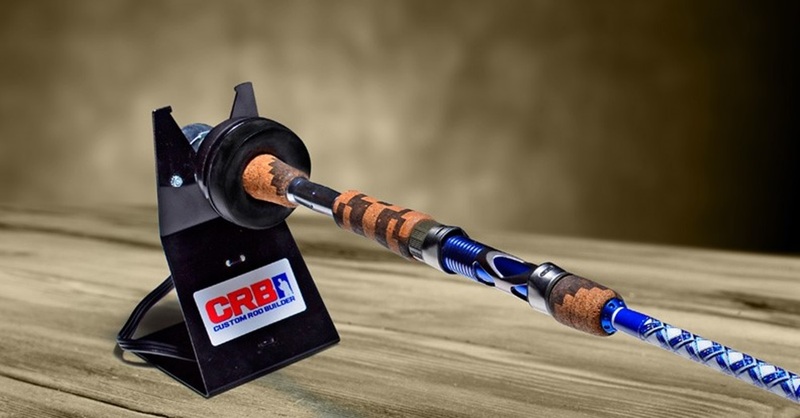 Again, your mileage may vary, and we are not saying a faster rod dryer is bad – just sharing what others are using. Most rod dryers used by the general rod building community use speeds of 18 RPM or less. More experienced rod builders & OEMs often use higher speed rod dryers. 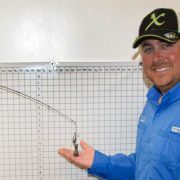 The type of epoxy you finish with may impact your rod dryer choice. 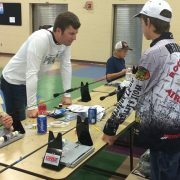 The type of guides you choose, and applications you build for, may impact your rod dryer choice. If you can, it is best to experiment with different speeds for different circumstances, and note what you feel works best for you. Now, go pick out your rod dryer!